How does the baton move up and down and at a curve to determine the time signature? What are the different movement patterns for 2/2, 3/2, 2/4, 3/4 and 4/4 time? What you're looking for are what we call conducting patterns. A quick Internet search for that term should provide you with everything that you're looking for (and will supplement any remaining questions you may have left over). For what it's worth, I would recommend the uppermost example; the fluidity between the beats is suited for much more music than the drum-major approach shown in the bottom example. The dots show what we call the ictus, or the beat itself. 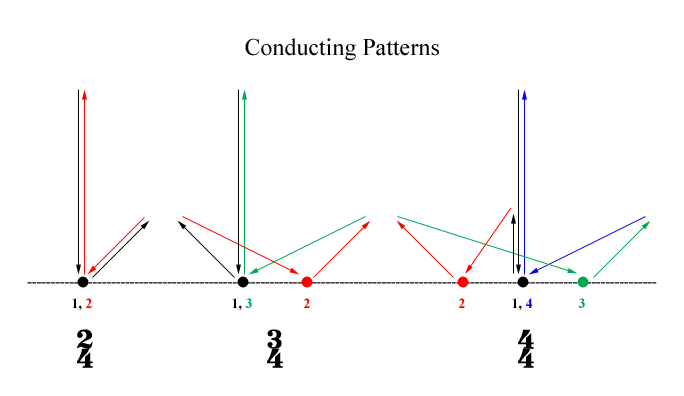 Practice conducting these patterns with a metronome and try to have the tip of your baton at these points every beat. I should also say that these patterns assume that you are conducting with your right hand. If you prefer to conduct with your left hand, just mirror these diagrams. In other words, the right-hand side of the above diagrams should be understood as "away from the body." Whereas beat 2 of 3/4 moves away from your body, beat 2 of 4/4 moves towards your body. 2/2 and 2/4 will be conducted like the 2/4 examples above, 3/2 and 3/4 will be conducted like 3/4, and 4/4 will (obviously) be conducted as 4/4. The first beat is always the baton (or hand) moving down from its highest position (also known as the down beat). The last beat in the bar is always up to the highest position (this is known as the up beat). The beat before the up beat is always a movement away from the conductor's body. Usually further out than other beats to signal that the up beat is about to happen. 2 beats in a bar is Down - Up. You can 'bounce' each one to sub-divide the beats, if appropriate. The most important thing is to make it clear where One is. When starting a piece, it is vital to give at least one clear, decisive, in-tempo beat BEFORE the beat with the first note. Not the answer you're looking for? Browse other questions tagged conducting or ask your own question.